Supernova is as you might expect set in space against a backdrop of stars and hues of deep blue and purple. Supernovas or supernovae, wormholes and fireballs spin on the reels against an ethereal instrumental soundtrack. It’s a rather attractive, colourful game that lulls you into a sense of being out of this world. If you’ve ever fancied a trip into space, this new online slots game will take you part of the way there. You can check out our entire list of slot games casino slot games. Swedish company, Quickspin, is a young company which formed in 2012, produce high quality games and whose staff are amongst their own players. The passion and enthusiasm of the developers can be seen in the unusual and out-of-the-box games which they design. Acquired by Playtech in 2016, the original Quickspin founders have stayed with the company. 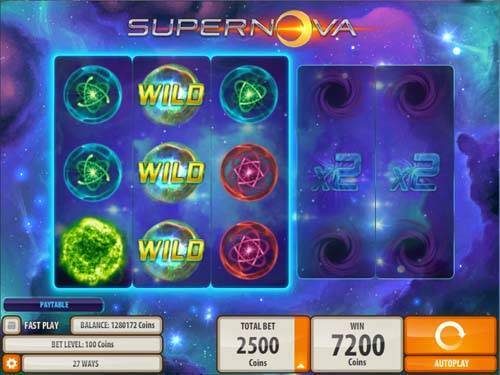 Supernova online game has a unique format. There are 5 reels but only the first 3 display the game symbols. The final 2 reels contain multipliers (which increase wins) and worm holes (which don’t). These 2 reels spin but only count if you get the same symbol showing up on one line of the first 3 reels. The multiplier on the middle line of the first of these final 2 reels is applied to the win on the first 3 reels. If a multiplier shows up on the middle line of the second of these final 2 reels it is then applied as well. The most you can get is 10 x 10 x giving a max of 100 x your initial win on the first 3 reels. It’s a simple and straightforward game to play otherwise. There symbols are supernovas, glowing orbs and fireballs. Click Paytable to view the symbols and work out the winning combos. Select your bet size anywhere from 25.00 to 12,500.00. You can select fast play if the spins are too slow for you. You can set the game to autoplay (spin 5, 10, 25, 50 or 100 times) or play manually. There’s no manual spin button so if you want to spin manually, open the settings (the cog icon) and select ‘Use space for spin’. Then you can use the spacebar to spin the reels manually. The aim is to get three of a kind on one row of the first 3 reels. This will give you an initial win. Then you want to get multipliers in the middle row of the final 2 reels, to multiply your winnings. If you get a wormhole on the middle row of the first of the final 2 reels you won’t get any increase, but if you get one on the middle row of the second of these final 2 reels, the first multiplier will count. 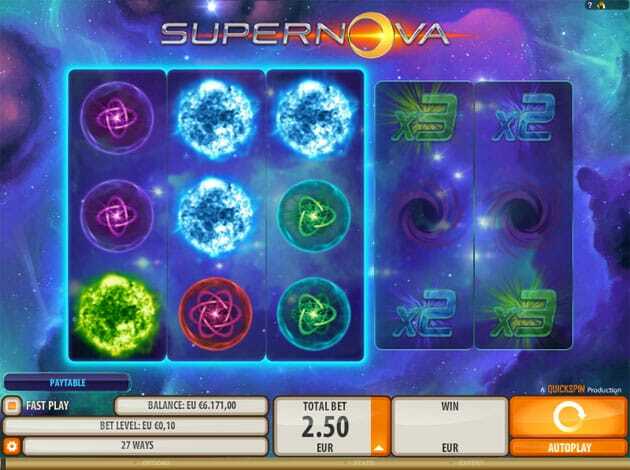 Easy to play and soothing on the eye and ear, Supernova online slots includes a potential bonus with every win with the unique arrangement of reels. It’s all about multipliers.